1 space left for this activity! Please take a look at this map to see if your school is in an eligible area. At each school, a group of thirty pupils would be selected from Year Eight to participate in the workshop. 3DW is flexible in how the participants are selected and can support the schools in the selection process. We are looking to deliver the workshops between March and July of 2019. The project will be based upon a resource package developed and utilised by 3DW under a previous workshop delivery series. This new proposed project titled ‘Working in STEM: Design and Build A Virtual Wind Farm’ aims to give students an engaging, balanced and educationally valuable bigger picture insight into the complexities of offshore wind farm design. 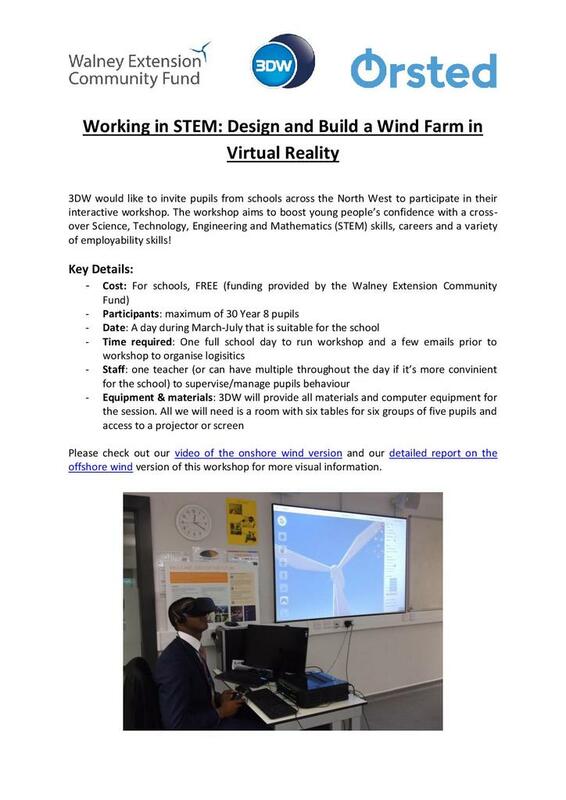 In small teams, pupils will be experiencing what it’s like to work on a wind farm development for the day. The teams will create their own ‘company’ with each member having a specific role such as Project Manager, Financial Manager, Technical Adviser or Public Relations (PR) Consultant. They will have to plan and design a wind farm layout considering real-life constraints and obstacles. The students start with the exciting task of creating a wind farm design taking into account the wind turbine size, power output and visual impact. Pupils will start to plan their design using a 2D map and then develop it using 3DW’s own bespoke software. As they are working on their design, they will also have to plan out a cable route to connect their wind farm to the National Grid. Once they have a design they are happy with, pupils will have to look at the costs of building and running a wind farm and using their numeracy skills, work out if their project is financially viable. Interlinked with these tasks is an opportunity to view their designs through an Oculus Rift virtual reality headset and have an immersive experience of their creations. Finally, they compile everything they have worked on into a presentation to pitch their design against the other companies, to the general public and stakeholders. There is a prize for the company with the best overall design and the workshop ends with a reflective exercise to assist pupils in developing their growth mindset. Not only will pupils develop their skills in a crossover of STEM subjects; they will also develop other skills such as leadership, collaboration, problem-solving and presentation skills.